This unique crystal world globe award will be adored by all! 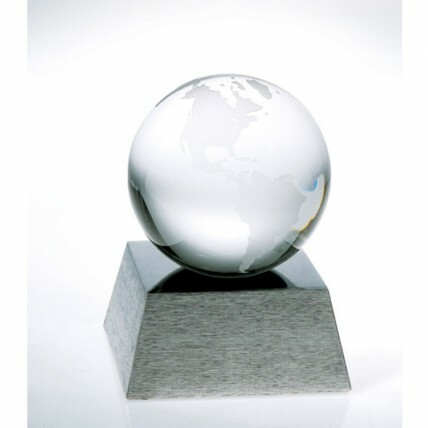 The Aluminum Base Crystal Globe Award features a clear crystal globe with a flattened bottom to sit atop the brushed aluminum base. Your engraving will be done on a black aluminum plate with silver lettering. This award is sure to make an impression at your next corporate event. Award this to an exceptional employee you think the world of! Production time for this product is 6 business day(s); expected pickup or shipping date is 04-30-2019.